Dependable yet pro-quality workhorse electro cutaway dreadnought that's entirely fit for purpose. Superb build. F1 Analog pickup/preamp system works well. Balanced tones. We reviewed the Martin DCPA4 back in 2011, and the only change we can detect since then is the move to the new 'simple dovetail' neck joint from the previous mortise and tenon. Rather than being a straight-sided, screwed-and-glued design, the simple dovetail is a more V-shaped, angled, sliding glued dovetail. It retains the threaded screw that holds neck and body together during the finish process, and differs from the higher-end, traditional dovetail in that it's CNC'd all the way, not hand-carved. "The DCPA4's neck uses the fast-feeling, satin-finished 'Performing Artist' profile"
Martin believes it to be a superior joint to the mortise and tenon, with improved vibration transfer. And, er, that's it for the changes - apart from the brown shaded top. The shaded or 'dark' finish is a Martin feature that dates back as far as the 1930s. It evokes a vintage vibe in a similar vein to the recent D-15M Burst, albeit under gloss here. The DCPA4's neck uses the fast-feeling, satin-finished 'Performing Artist' profile, which is wider at the nut and with a more even depth as you go up the neck than the modified low oval of the aforementioned D-15M; it feels more 'modern', and may suit lead-style, upper-fret playing better, with which the cutaway helps. The guitar also has scalloped X-bracing under the Sitka spruce top, albeit the A-frame version that works with the modern dovetail joint, but of most interest to live players will be the Fishman F1 Analog system. It comprises an under-saddle pickup and preamp that's very elegantly designed with just two push 'n' twist rubberised knobs and a single, circular readout. There are only two 'hidden' features in addition to the more obvious volume and tone adjustment: phase and tuner. 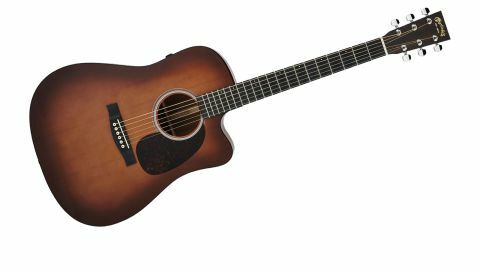 "It retains a good balance of mahogany punch and dreadnought warmth"
The DCPA4 is tighter-sounding than the D-15M Burst we use to compare, perhaps on account of its heavier build, with less of the direct attack and free resonance. It retains a good balance of mahogany punch and dreadnought warmth, however, and plenty of high presence. Plugged in, it's balanced and behaved, the F1 Analog performing ably. There's a broad usable range from the tone control, that spans warm and full for strumming, through more mids and presence for picking, and on to a more mid-scooped-type response. Coupled with the phase control, you can arrive at a usable tone quickly that, along with the obvious benefits of the cutaway, make it a versatile, able electro. The DCPA4 Shaded is the kind of workhorse guitar that will seem borderline humdrum to traditional Martin enthusiasts, largely because it nails its 'professional tool' status effectively, without any pretence to vintage spec or mojo. It's designed to work on stage night after night, month after month, as dependably as possible, and we've no doubt at all that it'll do just that.